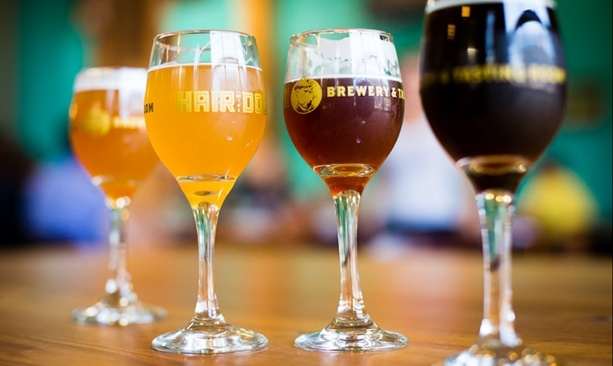 Hair of the Dog Brewing Company crafts big, boozy beers that age well. 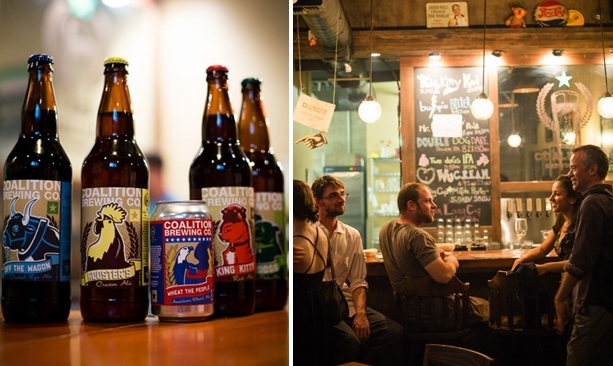 Coalition Brewing pub is a cozy neighborhood taproom that serves beer brewed across the street. In addition to crafting an array of reliably delicious beers, Coalition runs the Coalator Program, which brings home brewers into the brewery so they can brew their best recipes. Stop and smell the roses as you ride through lovely and historic Ladd’s Addition on the way to Apex. Apex has a serious beer bar with 50 taps and an impressive bottle list as well as bike parking adjacent to the beer garden. Apex's long communal picnic tables are usually packed with people on late summer nights and even some drizzly evenings. 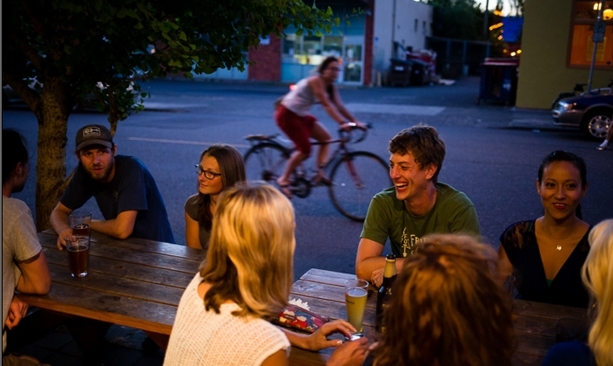 When it comes to bikes and beer, Portland is the land of plenty. With 75 breweries within the city limits, Portlanders can grab a brew of every style, from classic Northwest IPAs to barrel-aged barley wines and oyster stouts. The bike scene is equally vibrant. Bike lanes are crowded with commuters no matter the season, and cyclo-cross races draw thousands of bikers and spectators each fall. Beer and bike cultures naturally overlap, and not just because beer tastes great after a long ride. 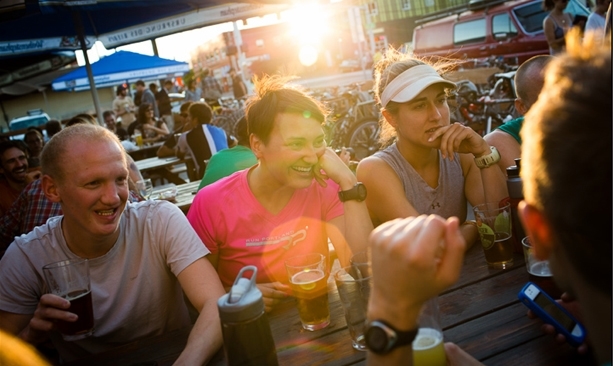 Exploring the city’s beer scene through pedal power is an unforgettable experience. Not only can you indulge in two of Portland’s greatest passions, you’ll enjoy hassle-free parking and the smell of fresh beer brewing as you ride through the city. 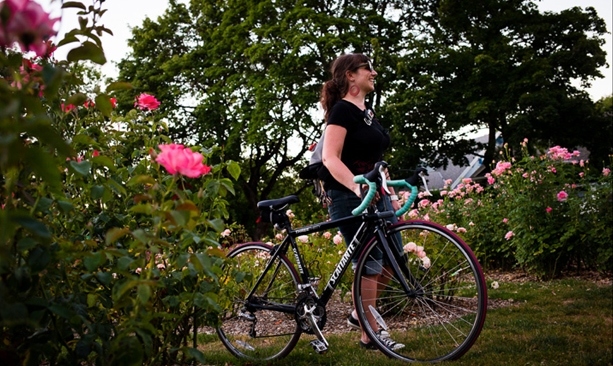 This bike-and-beer tour focuses on east-side beer destinations. However, it’s not an invitation to get drunk and ride a bike; you don’t have to quaff a pint at every spot. Mix it up by sharing tasting trays with friends and ordering food instead of beer at some locations. Please drink and ride responsibly. Start at Burnside Brewing Co. on the north side of Burnside Street, the official dividing line between the city’s north and south sides. This brewery has become famous for two things: beers made with experimental ingredients and a menu heavy with meat. Don’t miss the Sweet Heat — a delicious wheat ale brewed with Scotch bonnet peppers — or the juicy beef burger seared in duck fat. 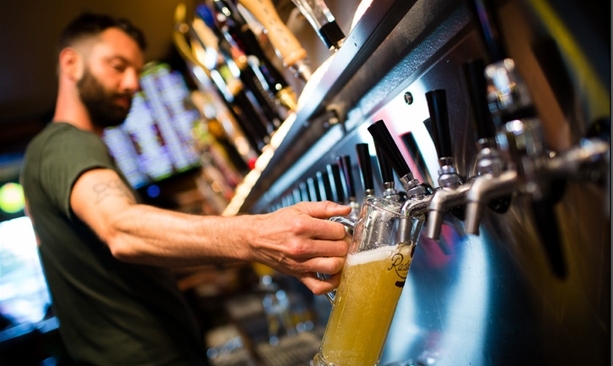 Head east about 10 blocks (be careful while crossing busy Martin Luther King Jr. Boulevard and Grand Avenue) to the Rogue Eastside Pub & Pilot Brewery, a popular gathering spot for craft beer aficionados, formerly the Green Dragon. With 45 beers on tap, weekly Green Dragon Brew Crew releases and unique experimental Rogue brews, plus a dog-friendly patio, the Pilot Brewery isn’t to be missed. Go to 16th Avenue and head north into a leafy residential section of the Buckman neighborhood. Take a right on Ankeny Street, where you’ll undoubtedly join a throng of cyclists on the iconic bicycle boulevard. Eventually you’ll come to Coalition Brewing, a cozy neighborhood taproom that serves beer brewed across the street. In addition to crafting an array of reliably delicious beers, Coalition runs the Coalator Program, which brings home brewers into the brewery so they can brew their best recipes. Ask if a Coalator beer is on tap, and taste just how good home brew can be. For the longest leg of this route, head southwest two miles, through historic Ladd’s Addition to Apex, a serious beer bar with 50 taps and an impressive bottle list. Not only is the place a craft-beer mecca, it’s a shrine to two-wheeled transportation, with bike and motorcycle parking framing the interior of the spacious beer garden. There, long communal picnic tables are packed with people on summer nights and even some drizzly days. But that shouldn’t be too much of a surprise. This is Portland; we ride bikes and drink beer no matter the weather. 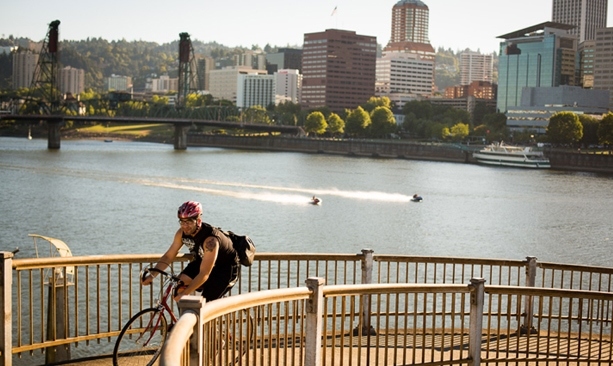 Where to rent: You don’t need to bring a bike to Portland — there are plenty of places to rent one, like River City Bicycles and Clever Cycles, or Nike’s new street-side bike share program, BIKETOWN. 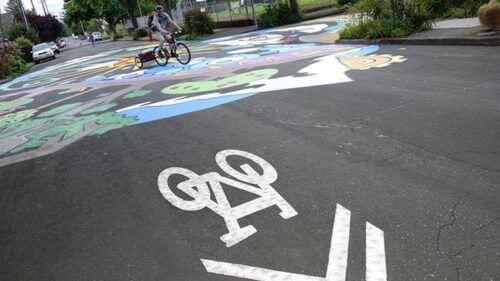 Know the routes: Familiarize yourself with Portland’s bike-friendly roads. 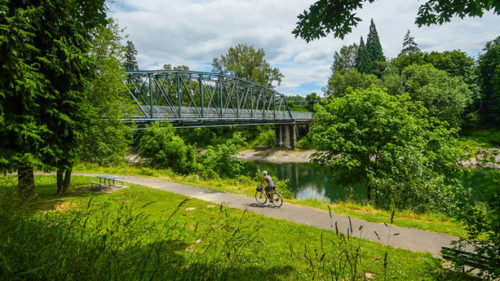 Now the city has its own interactive digital Portland Bike Map, which shows the designated bicycle roadways and connections. 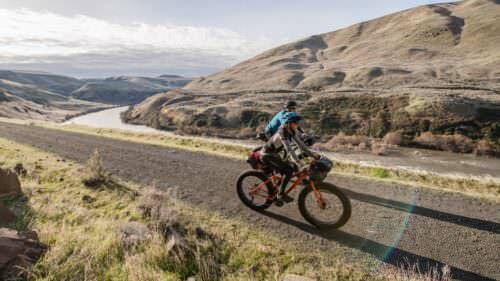 Extend your stay: Spend the night at Portland’s Friendly Bike Guest House, just two miles from downtown Portland, the Pearl District, Portland’s famed Riverside Loop cycling trail and Forest Park.